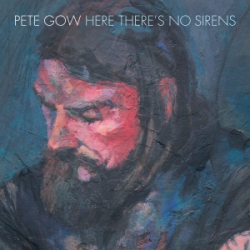 Pete Gow, veteran frontman of the acclaimed Case Hardin, has recorded his first solo record ‘Here There’s No Sirens.’ Released on the same label as Case Hardin, Gow’s sound is a deliberate departure from the band’s usual fare. This album is stripped back, focused, and deeply personal. The songs are a mixture of an almost confessional style, with some character driven tracks and one good old fashioned story song, ‘Some Old Jacobite King’. Gow spent many years working as a journalist, is the main songwriter for Case Hardin, and clearly has a knack for snappy lines. Some great lyrical hooks can be found throughout, such as “songs are like tattoos; you should think before you name one after a girl”. Sage advice. Gow’s obvious lyrical chops are underpinned by some perfectly restrained instrumentation, too. There’s some gospel-esque organ, orchestral embellishment and backing vocals, but it’s all mixed together to complement the driving thrust of Gow’s vocal and acoustic guitar which runs throughout. A possible criticism is that the record is a little one-note in terms of pace; the songs are all fairly slow and ponderous, there’s no rocky number to break the tension. When the album is so honed in on the sort of personal experiences it deals with, though, this potential flaw becomes a strength. The slow and steady pace builds and builds and creates a tangible atmosphere of melancholy as the record progresses. The instrumental restraint shows great maturity; it’s so easy to over produce and over embellish, especially when embarking on a solo venture for the first time, but Gow walks the line with poise. This is a deeply personal and intimate set of songs with some great lyrics and astute musicianship, all recorded wonderfully and delivered with heart. A mature and accomplished solo debut. Excellent.